Long before the Long Island Medium got her own TV show, there was Margery The Medium. I've written about Margery before, but I wanted to show you this wonderful picture of Margery's grave. The man in the photo is famed escape artist Norman Bigelow and he graciously has allowed me to post the photo here. Margery was kind of Houdini's arch nemesis. She had everyone at the Scientific American Magazine fooled into believing she was a legitimate medium. Houdini got wind of that and said "NO WAY!" and forced himself into the investigation and proved that she was using trickery. The battles between Houdini and Margery were priceless, though all these years later I can't help but wonder how much of that was for show. An interesting note on the grave stone itself is the name above Margery's. By the way, Margery's real name was Mina Stinson Crandon. 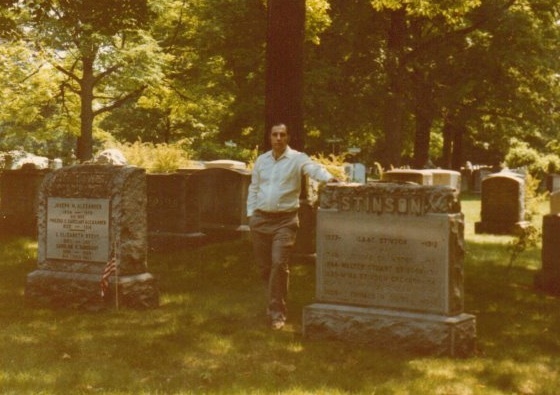 The name above hers on the tombstone is WALTER Stuart Stinson. If you're familiar with the story of the seances that she put on before the Scientific American Committee and Houdini, Walter was her brother and spirit guide. Walter was also known to use some rather politically incorrect language. But he was dead, so no one cared, lol. Neat. Thanks. And thanks, Norm.